Our midwives, Timay and Love-Sandra, attend approximately 150 births a year in Dèsarmes, Haiti. The Clean Birth Kits are pre-packaged for individual use; ensuring they are clean and ready for a delivery. 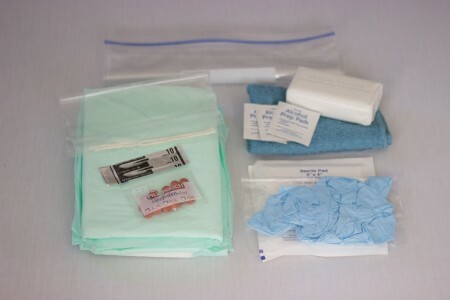 Items contained in the Clean Birth Kits reflect the World Health Organization’s six principles of cleanliness for birth including, (1) clean hands, (2) clean delivery surface, (3) clean perineum, (4) clean cord cutting instrument, (5) clean cord ties, and (6) clean cord care of the newborn baby. Please consider helping us provide Clean Delivery Kits by, (1) Donating Items, (2) Donating Money, and/or (3) Organizing Assembly Group (Organize a fun group of family, friends, church group and/or organization to donate items and spend the time packing up Clean Delivery Kits.). Each Clean Delivery Kits cost around $3. You can purchase many of the items on Amazon by viewing our wishlist.